For the love of chocolate. That’s how it all began for us in 1999, when we established Wine Country Chocolates in the beautiful Sonoma Valley. 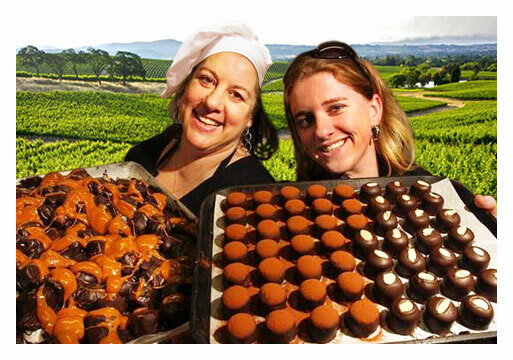 We’re Betty and Caroline Kelly, mother and daughter, and partners in a chocolate adventure. It wasn’t always chocolate for us. Betty comes from the legal world, and before falling into chocolate, Caroline was a hospitality professional. True passion for the best, most pure tasting chocolate led us to put our 9 to 5’s on hold and start training as chocolatiers. After hours of study and practice, and lots of gratifying experimentation we created a line of confections that surpassed all expectations of world-class chocolate. Our incomparably creamy truffles quickly became our signature offering. While traditional truffles are rolled, Wine Country Chocolates’ truffles are formed, hand-pressed, and delicately enrobed in a generous layer of dark chocolate. After perfecting our truffle recipe, it was a logical next step for us to pair our chocolates with the bounty of fine wines from the region. We found that Zinfandel, Cabernet Sauvignon and Port wines best matched the truffles, and were added to our menu of other fan-favorite flavors, including Cappuccino-Tiramisu, Fresh Orange and Dulce de Leche. We spent the next several years wowing the chocolate wholesale world, local wineries, and farmer’s market foodies. In 2006, through the advice of friends and fans, we opened our first retail space, and the very first Chocolate Tasting Room in Sonoma Valley. We are fortunate to have a staff of fellow chocolate lovers who are dedicated and knowledgeable. Locals and tourists alike can enjoy sampling the rich, all-natural flavors and treats that Wine Country Chocolates has to offer at our original location at Jack London Village in Glen Ellen and on the Plaza in downtown Sonoma.